We have many accompaniment forIdlis and Dosas.Coconut chutney and sambar are common side dishes.Ridge GUORD gosthu is an easy one. 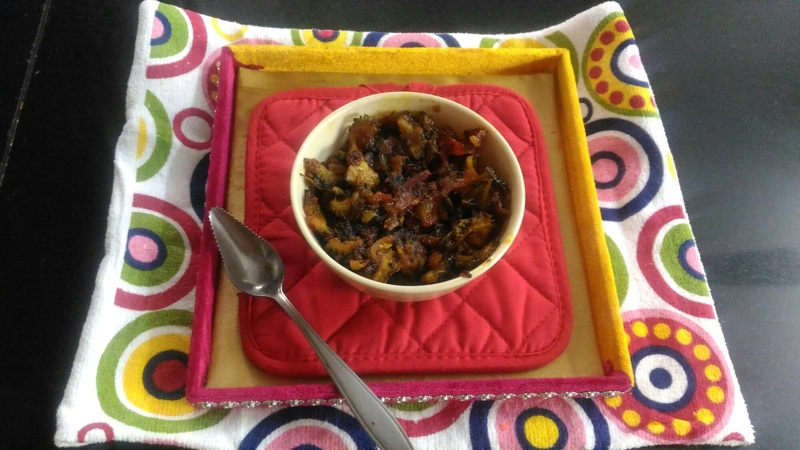 Those who are allergic to brinjal can have this side dish. Peerkangai has many health benefits. This is rich in dietary fibre and vitamins.It aifs in good digestive system. Coriander leaves finely chopped 1 to 2 tbs. 1.Wash ridge guord and peel it’s skin and chop it. 2.Keep a wok or idli container to cook it.This will cook quickly. 3.When cooked remove from fire and when it cools put in mixer with green chillies and make it a paste. 4.Heat a pan drizzle oil to it.Temper with mustard seeds,urad dhal to it add curry leaves and then add onions fry till it turns pinkish. 5.Now add the grounded ridge guord with little water with required salt and asafoetida powder.Allow it to boil.Add coriander leaves. 6.When it is ready serve with idlis. I take this opportunity to thank my fellow bloggers,friends and family members for the support extended to me. 1.Fry the cashews in one tbs. Gheeand keep aside. 2.Fry the rava golden brown. 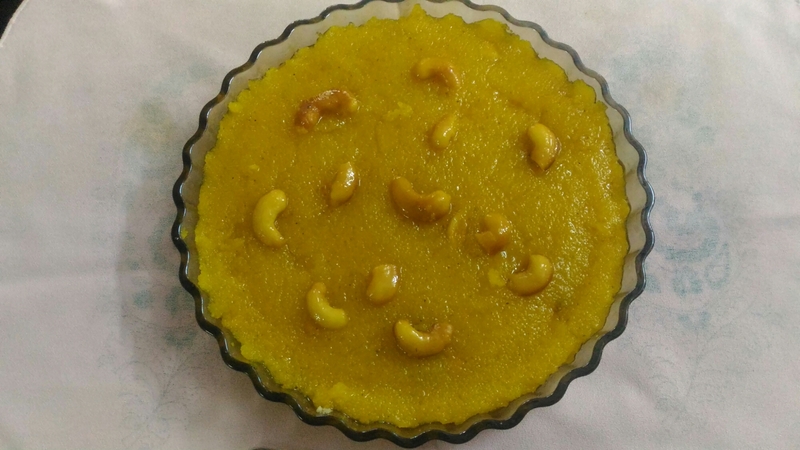 3.Take 3 cups of water and boil it.Add kesari powder to it. 4.To the fried rawa add the boiling water slowly with one hand and keep on stirring with the other hand.See that no lumps are formed. 5.When the rawa is cooked add sugarpp. 6.mix well and keep on stirring. Vessel add fried cashews and cardomom powder. 9.Put in greased plate.can cut into desired shape or serve in a bowl. 1.Can add pineapple essence to it. 3.Can refrigerate for 1 or2 days. 4.When you reheat it add little ghee to it. 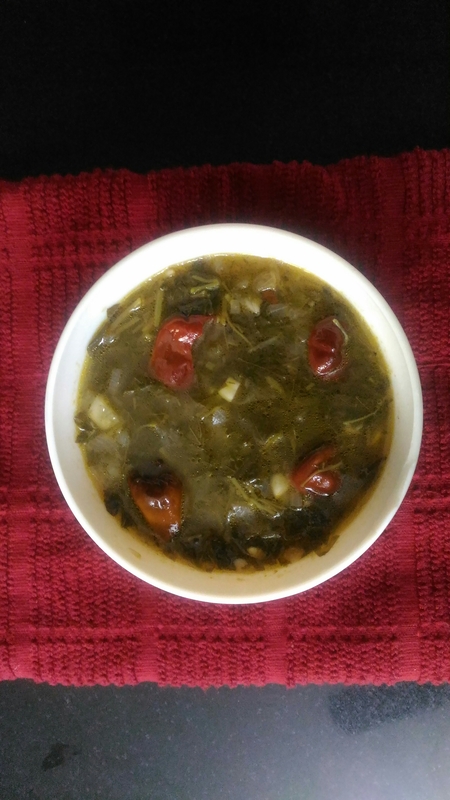 We can prepare different dishes with greens.This is an easy recipe also very healthy one. 1.Clean the keerai by removing the roots.Wash to remove soil from it.Chop it finely. 2.Heat oil in a kadai add mustard seeds when it splutters add urad dhal and fry. 3.Now add red chillies after a while add chopped onions and garlic saute for few seconds. 4.Now add chopped greens it. 5.Now add tamarind water extracted from tamarind appr.1 to 2 cups. 7.Allow it to boil for few minutes. It is ready to serve. Serve with pottukadadalai chutney for rice. Red chillies :2 or 3. Grind all these ingredients in a mixi.. This is in powder form can store for a longer period. Before serving take little powder mix with water so that it is in chutney form. Another variation is that you can add two pods garlic with little coconut scrapings and grind in a jar.chutney is ready. As the name suggests the taste is the most bitter among all fruits and vegetables. It can be used as both medicine also as food. 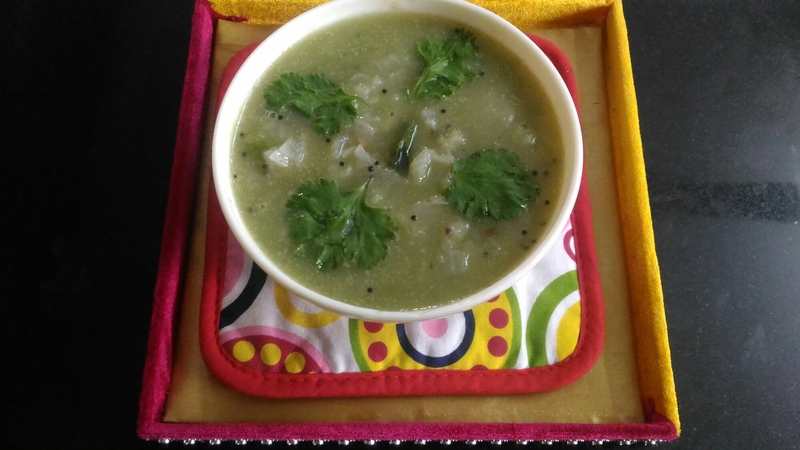 This is a simple recipe made in South Indian style goes well with plain rice or as a side dish with rasam rice,sambar rice and even for curd rice. 1.Remove the seeds and cut the bitterguord into cubes. 2.In a kadai first put oil then mustard seeds and when it splutters add urad dhal. 4.Add chopped onions and bitterguord and fry them. 5.After sometime add tomatoes,them add turmeric powder,chilly powder and required salt and fry well. 6.When almost done add jaggery and mix well. Fry till everything mixes well. If for diabetes patients need nor add jaggery.